This is a revision of a post I did last week on Olympic costs, related to the recent announcement of Rio 2016 costs. I withdrew the post when an error was noted in parts of one column. Unfortunately that column affected several others, so I had to re-do the stats. Thanx to Rich Perelman who noted an error on the numbers for LA 1984, which alerted me to the error in that column. This revision will be some of what I presented last week, but the revision of the data actually revealed some stats that were new to me and could be important in predicting participation figures and Organizing Committee (OCOG) costs at future Olympic Games, so I will discuss those in some detail. This will be somewhat of a long post but I think an important one. The Rio de Janeiro Organizing Committee announced the final budget figures for the 2016 Olympics, with expenses of $13.1 billion (US). A huge number and well over the original projected expenses predicted during Rio’s candidature – the Oxford Olympics 2016 Study had Rio costs estimated as $4.6 billion. As I’ll discuss further on, candidature projected expenses are usually not close to the final numbers, but perhaps this post can help with that. So how expensive was Rio relative to other recent Olympics? We’re only going to look at the numbers since the 1964 Tokyo Olympics, which really started the “modern” era (post-television) of Olympic Games. The table below gives the figures for final expenses given by the Organizing Committees in their final reports. More important is to know how these are corrected against inflation (using US dollar inflation from historical data), which is noted in the right-hand column. 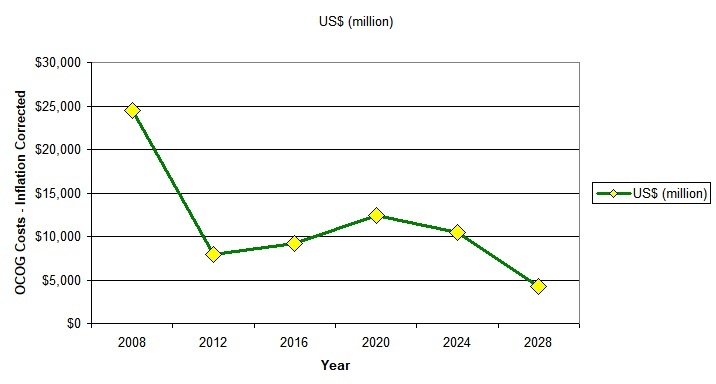 The numbers below are given in millions (106) of US dollars, with 2000 as the benchmark year, so $1926 = $1,926,000,000. You can see how important the inflation corrections (IC) are. Tokyo 1964 spent $1.926 billion, but in actuality that would be $11.788 billion in 2000 dollars, more expensive in real dollars than any recent Games except Beijing. However, Beijing 2008 was a much, much bigger Olympics than Tokyo 1964. Beijing hosted 203 nations, 10,901 athletes, and 302 events; while Tokyo only hosted 93 nations, 5,137 athletes, and 163 events. A huge difference. The important comparison between Games appears to be to use constant dollars, correcting for inflation, but also to correct for the number of athletes competing, and the number of events held. You can do a regression analysis and see that both of those factors, as they increase, also increase OCOG costs – I’ll spare you that analysis. More athletes cost more – you have to feed them, house them, and protect them, and some organizing committees also provide travel expenses for some nations’ athletes. More events greatly increase costs because it often means new venues to be built, more security issues for each event, and more facility and personnel costs for each event. Now let’s see how Rio comes out when we do this comparison. 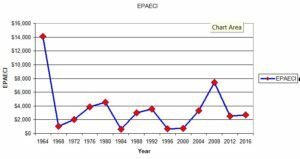 The last column is the important one – EPAECI – the statistic of interest, and now Rio 2016 doesn’t look so bad. In fact their EPAECI of $2,692 compares favorably to recent Olympics. Its almost the same as London, and less than Athens 2004, Barcelona 1992, and Seoul 1988. Many of the Games from 1964-2016 had an EPAECI in the $2,500-$3,000 range, and Rio was on the low end of that range. Admittedly the $13.1 billion was well above original projections, but below I’ll show how we can likely actually predict what the final number might be, based only on two relatively known factors. A couple things stand out from this comparison. Tokyo 1964 is by far the most expensive Olympic Games of all-time (summer only – Sochi crushes it including the Winter Games). In fact, Rome 1960 had an EPAECI of $571 so the cost inflation at Tokyo 1964 is an Olympic record of sorts. Secondly, Beijing 2008 is the second most expensive Olympics ever, at a $7,440 EPAECI, which most people probably suspected. Thirdly, Rio now does not look like quite so bad in that chart, does it? Further, 9 Olympics from the cohort of 14 were fairly similar – there were the expensive outliers of Tokyo 1964 and Beijing 2008, and the parsimonious outliers of Los Angeles 1984, Atlanta 1996, and Sydney 2000, but there are not major differences between the other 9 Olympics Games in term of EPAECI. One might say that Montreal 1976 and Moscow 1980 were over the historical average, but I would argue that they were not. Both Olympics had boycotts – 1976 by African nations opposed to a recent New Zealand rugby team visiting South Africa in the era of apartheid; and 1980 by a US-led boycott over the recent Soviet invasion of Afghanistan. Only 92 nations competed at Montreal, and 80 at Moscow, versus 121 at Munich in 1972. About 30 nations boycotted Montreal, and circa 60 boycotted Moscow – it’s not easy to be precise about those numbers. So there should have been about 122 nations at Montreal, and 140 at Moscow, and Montreal and Moscow planned for that many nations, and the requisite increased number of athletes, and spent money based on that planning. If you assume constant numbers of athletes per NOC, Montreal would have had 8,053 athletes and Moscow 9,203. Using those numbers the EPAECI for Montreal comes in at $2,908, and Moscow at $2,591, well within the historical $2,500-$3,000 range. Finally, three Olympics stand out for their penury – Los Angeles 1984, Atlanta 1996, and Sydney 2000. What do they have in common? None of them were government-run Olympics, with all of them run as businesses that had to balance the books – and they did. These Olympics prove it can be done, but not by increasing costs at every corner, and trying to out-do the previous OCOG, or keeping up with the Joneses. Peter Ueberroth started this policy with Los Angeles 1984. Not always well liked while he was doing it, he should be applauded for showing how it can be done. Of note, using the arguments above for Montreal and Moscow, the smaller 1984 boycott also makes Los Angeles 1984 look even better, as their EPAECI could have been as low as $560, a number not seen since Melbourne 1956. However, OCOGs cannot keep costs low if they are forced to add more and more athletes and more and more events, and that is a problem. Rio had 306 events. Tokyo 2020 will likely have 339 events, with the recently announced addition of 15 events, and addition of 5 new sports (18 events) – baseball/softball, karate, skateboarding, sport climbing, and surfing. The onus, therefore, is on the IOC to decrease costs by minimizing the number of events and keeping the number of athletes as low as possible. The Olympic 2000 Commission, formed ad hoc after the 1999 Olympic Bribery Scandal, recommended maxima of 10,000 athletes, and 300 events. No Summer Olympics since 2000 has achieved either goal. So since the IOC wants every nation to compete, the only effective way to keep down the number of athletes competing is to limit the number of events. Unfortunately, it seems to be going the other way. The only other factor that can be changed in the above formula is the 0.174, which would require having fewer athletes per nation, probably limiting the number of athletes allowed per event, or having stricter qualifying standards. We saw above that most (9/14) Olympics (since 1964) have had an EPAECI in the $2,500-$3,000 range, and I just showed how can we predict the number of athletes that will compete. The number of NOCs competing is now going to be pretty constant at 206 – there are just not many nations left in the world that could compete. 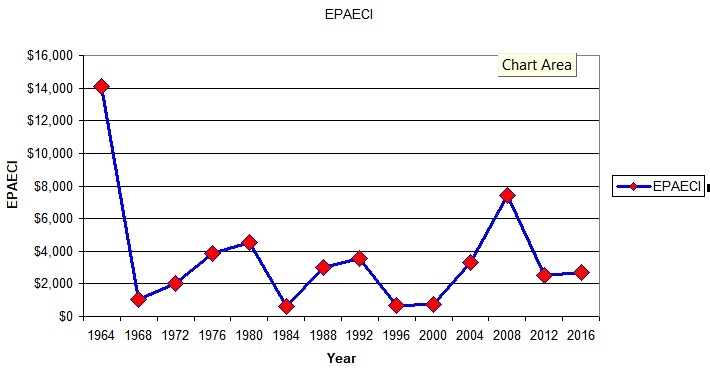 If we know the number of events, since we can use NOC = 206, we can use our EPAECI range to estimate final Olympic costs. Let’s see how this works out for 2020-2028, comparing them to 2008-2016. Here we have to project US dollar inflation in the future, and I have used 2.5%/year, which is close to the historical mean. The last 2 columns show the projections, first in actual dollars, and then corrected for inflation. Paris 2024 would come in cheaper than Tokyo 2020, but actually more expensive than London or Rio, and that is because of the increased number of events. 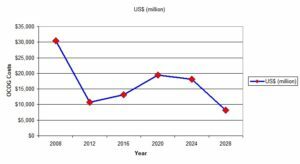 You can see in the above chart how good LA 2028 would look, cost-wise, and also that Paris 2024 will likely come in relatively more expensive than Rio 2016, due to the increased number of events. 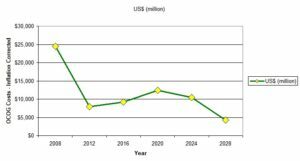 Los Angeles 2028 could be the least expensive Olympics since Sydney 2000, at just over $8.1 billion. Since previous US-based Olympics, and Sydney, had EPAECI much lower than $1,000, that estimate for Los Angeles may well be high. Further, I suspect that number for LA 2028 is high, because all of its venues are already built, as opposed to most OCOGs. There are several take home points from this analysis. 1) Olympic costs are related to the number of athletes competing and the number of events contested, two parameters that are largely outside of OCOG control, but actually controlled by IOC decisions; 2) The IOC can only control these Olympic costs by limiting the number of events contested, although they are going in the other direction, or by limiting the number of athletes per event and per nation, either by having less athletes per nation in each event, or with stricter qualifying standards; 3) Rio 2016 exceeded its predicted costs by a significant factor, but it was not relatively more expensive than recent Games; 4) This highlights that early predictions of Olympic costs by OCOGs are invariably low, and should be looked at with a jaundiced eye; 5) The future number of potential athletes competing can be predicted fairly accurately with a simple formula; 6) Using the predicted number of athletes competing, reasonable estimates can be made of potential Olympic costs using the EPAECI factor. 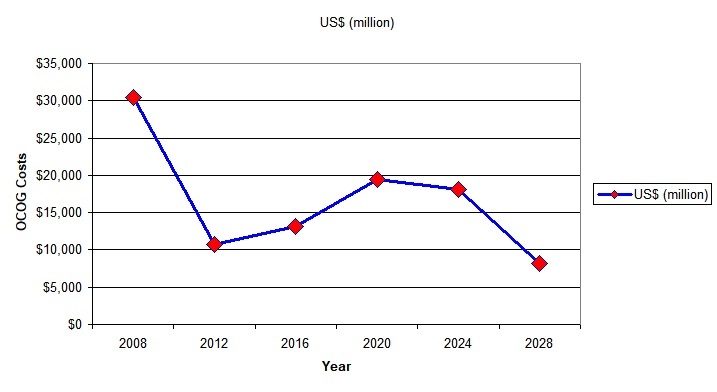 The EPAECI-predicted costs will almost certainly exceed the predicted costs announced by bid committees and OCOGs; and finally, 7) Olympic costs have been well-controlled in the past 50 years by OCOGs that have not been government-run but run as businesses with a careful eye on the bottom line. It can be done. The IOC today announced multiple changes to the Tokyo 2020 Olympic Programme, adding numerous mixed events, several “street” events (such as 3×3 hoops), and trying to equalize the program by genders. One thing this will do, however, is greatly increase the size of the 2020 Olympics, something the IOC has been trying to ward off. In 2000, in the wake of the Olympic Bribery Scandal, the IOC formed the IOC 2000 Commission to look at ways to revise the Olympic Movement and Games. Two of the recommendations were to limit the size of the Summer Olympics to 300 events and 10,000 athletes. Rio 2016 had 306 events and 11,182 athletes, and no Olympics since 2000 has had less than 10,500 competitors. The IOC announced that there will now be 321 events at Tokyo, and by limiting athlete quotas in many sports, will decrease the number of competitors by 285 athletes. However, they did not take into account the 5 new proposed sports, which have been assumed to be a fait accompli – baseball/softball, karate, skateboarding, sport climbing, and surfing. If one looks at the IOC’s own publication on this – see https://stillmed.olympic.org/media/Document%20Library/OlympicOrg/…/Olympic-Pr… – that would add another 18 events, bringing the total to 339 events for Tokyo 2020. Further, the IOC is projecting 474 additional athletes in the new sports, which more than eliminates the savings from the new sports quotas. This would bring the projected Rio total to about 11,500 athletes, and I would not be surprised to see it reach close to 12,000. 2020Plus are the numbers assuming the 5 new sports are accepted as proposed. That would come to 339 events and a 10.8% increase over the size of the Olympic Program. Since 1948 that will be the second biggest increase, after a 13.4% increase for Munich 1972. It is also about the same as Sydney 2000, which increased by 10.7%. The Munich increase was driven by a few new sports (archery, handball, and judo returned to the program after missing 1968), and new weight classes for men in weightlifting and wrestling. The Sydney increase was from a few new sports / disciplines (trampoline, triathlon, taekwondo), but mainly from adding women’s sports and events – modern pentathlon, water polo, weightlifting. If you look at the table you will see the IOC is approaching gender equity with the program. Women will be able to compete in 51.3% of the 2020Plus Program, while men will be eligible in 54.0% of the Program (it adds to > 100% because of mixed events). That is admirable and there are certainly no complaints about it. It follows Bach’s proposals in Agenda 2020 to have an event-based program instead of a sport-based one, and to achieve gender equity. But with a proposed 339 events, and maybe approaching 12,000 athletes, one has to wonder when the current era is one in which cities are refusing to bid for Olympics because they have become too big and too expensive. It may require further IOC legerdemain to reverse that trend.